Congresswoman Ann Kuster sent a staffer to read the attached letter to the citizens of New Hampshire (and the U.S., for that matter) at the New England Long-Term Power Outage Summit on November 10, 2018. 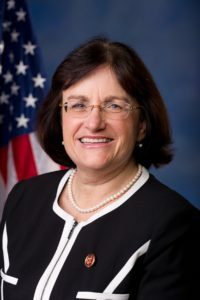 We have all heard politicians make promises, but I take Congresswoman Ann Kuster at her word that she considers that “strengthening the resilience of America’s electrical grid is vital to the security of our country and its citizens.” She also thanked the Secure the Grid Coalition for their work on this issue. We asked the citizens at the Summit to write Congresswoman Ann Kuster to thank her for her support on this issue. I am asking everybody reading this to do the same – whether you are from New Hampshire or elsewhere. This is a national issue. 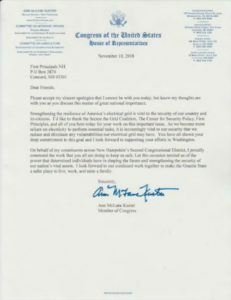 I am putting a copy of my letter to Congresswoman Ann Kuster below. Please write to her – and any other member of Congress that represents you. If you live outside of New Hampshire, I would recommend attaching a copy of Congresswoman Ann Kuster’s letter so we can get some of these members of Congress together on this issue. To find your representative, go to the U.S. House of Representatives’ website by clicking here and enter in your zip code. It is going to take a groundswell of citizens contacting their representatives to spur Congress into action. Be a part of it! I am a New Hampshire resident and I was at the New England Long-Term Power Outage Summit on November 10, 2018 when your staffer read your letter to the audience. As a citizen of the Granite State – as well as a member of the Secure the Grid Coalition – I was very happy to hear that you too are concerned about the security of the electric grid. I believe that a two-pronged approach is necessary. First, Congress must fix the failed current regulatory scheme which has proven unable to protect the self-regulated electric grid. The Federal Energy Regulatory Commission (FERC) either does not have the power – or the will – to force the industry to protect the grid and Congressional intervention is required. 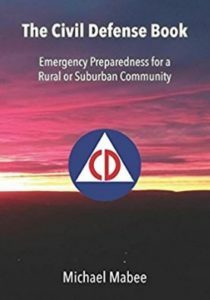 Second, we need Congress to reintroduce the bipartisan H.Res 762 from the 112th Congress (“Expressing the sense of the House of Representatives regarding community-based civil defense and power generation”). This resolution would send a message to the 35,000 towns and cities across the United States that we need to build a culture of preparedness. This is a bipartisan issue and is an opportunity for us to heal this polarized nation. I ask that you do two things in order to help us protect the electric grid and prepare our citizens – and nation – to survive a catastrophic power outage should protection fail. I ask that you join the bipartisan Congressional Electromagnetic Pulse (EMP) Caucus. Protecting the electric grid from the most significant hazards such as electromagnetic pulse (EMP) attack, geomagnetic disturbance (GMD) and cyberattack are critical to the national security and action must be taken immediately. The Secure the Grid Coalition can offer Congress expert witnesses and studies to assist you in these endeavors. We will keep in touch with you going forward as our partner in this critical work. Expressing the sense of the House of Representatives regarding community-based civil defense and power generation. Mr. BARTLETT (for himself, Mr. FRANKS of Arizona, Ms. CLARKE of New York, and Mr. JOHNSON of Georgia) submitted the following resolution; which was referred to the Committee on Transportation and Infrastructure.